Sharps BIG PAD PN-65SC1 has been developed for classrooms, higher education campuses as well as office meeting rooms and workspaces. Building on Sharps expertise in advanced smart interactive display solutions, the PN-65SC1 offers flexible and powerful application enhancement opportunities via the Mini OPS slot extension. Offering the latest on-screen collaboration capabilities with attractive price performance, Sharps latest 65 BIG PAD interactive flat panel display can help you enhance communication and create the conditions for best collaboration. Whether in a classroom or a meeting room, it can sometimes be a challenge to keep everyone focused and engaged. 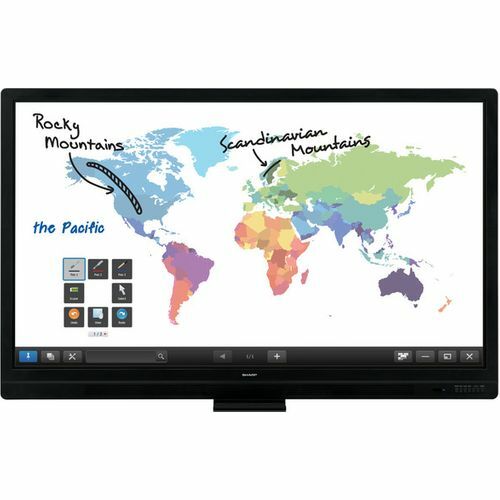 The generous full HD 65" touchscreen monitor lets you display, create and collaborate with ease and precision. The PN-65SC1 offers significant application flexibility with its Mini-OPS extension slot, which can take for example the wireless collaboration module, or integrated PC module, to provide very easy and attractive performance enhancement. A direct button, Freeze-Frame, on the bezel allows better classroom and training or meeting room management. Full connectivity with DisplayPort, HDMI and VGA video inputs ensure straightforward connection to all PC devices. In-built speakers of up to 10W 10W ensure a full multi-media experience and a LAN or RS232C connector allows for easy remote control through the network of important display features, functions and diagnostics.